On Saturday 29th April, six days after the Rising began, the rebels had been driven from their central position at the GPO. From their new base at No. 16 Moore Street, Patrick Pearse, accompanied by Elizabeth O’Farrell, surrendered unconditionally to Brigadier General Lowe. He was taken to Arbour Hill Prison, from where he issued the surrender order to the various garrisons. By Sunday evening all the outlying garrisons in Dublin had surrendered. When the fighting stopped Dublin could begin to assess its loss. There had been many deaths; about 65 Volunteers, up to 300 civilians and over 100 British Army soldiers had lost their lives, with many more injured. The extent of the physical damage to the city centre could now also be seen, with many areas receiving significant damage, and the areas around the GPO and Middle Abbey Street, Sackville Street, Henry Street and Eden Quay being almost completely destroyed. Soon afterwards a number of publications appeared featuring photographs of the aftermath of the Rising; Dublin After The Six Days Insurrection by T. W. Murphy, published by Mecredy Percy, Dublin, Dublin and the Sinn Fein Rising published by Wilson Hartnell of Dublin, The Sinn Fein Revolt Illustrated published by Hely’s of Dublin, The Sinn Fein Rebellion Picture Souvenir published by W. & G. Baird Ltd of Belfast, and The Rebellion in Dublin, April 1916 published by Eason & Son Ltd. Souvenir photographs of the Rising were in demand! Valentine & Sons, a picture postcard company, also produced a set of photo postcards depicting the city, sold in a set of six. These are often seen in museum collections not only as individual cards but also as part of scrapbooks and albums that people made in the months after the Rising. I often think the creation of these albums, containing the postcard photographs alongside newspaper cuttings, is an indication of how the people of Dublin at the time were affected by the sight of the destruction of their city. This is a selection of photographs taken from Dublin After The Six Days Insurrection, taken by T. W. Murphy. They are full of people, and it always strikes me that life for them had to go on despite the very changed city landscape they suddenly found themselves in. 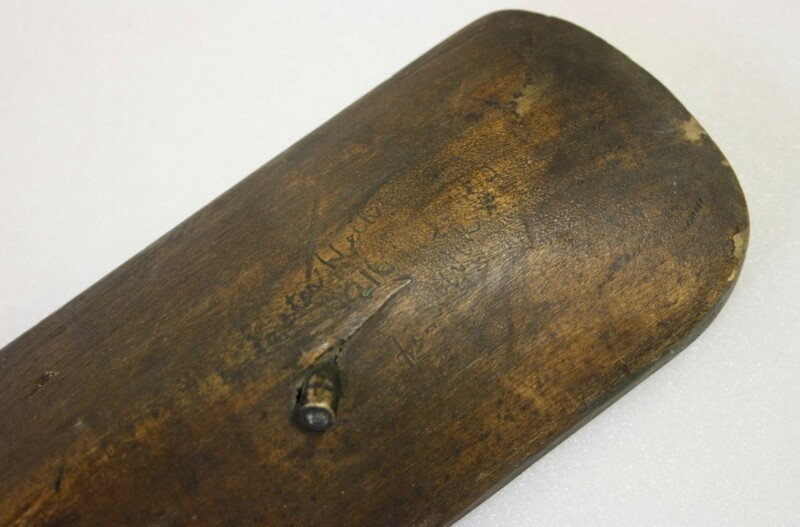 This weekend was the Object Matters – Making 1916 Conference in Dublin. It was a great event; congratulations to the organisers and the speakers, who gave papers ranging from the 1916 Proclamation, ephemera, internment material and the various public collections, their objects and their exhibitions. I’m looking forward to the proceedings! Recently I posted about a Cumann na mBan St. Patrick’s Day card, which was published in 1918 by Fergus O’Connor. O’Connor was one of the main publishers of republican material, and the National Museum has many examples of his work. There is also a large collection of material published by O’Connor in the National Library of Ireland. 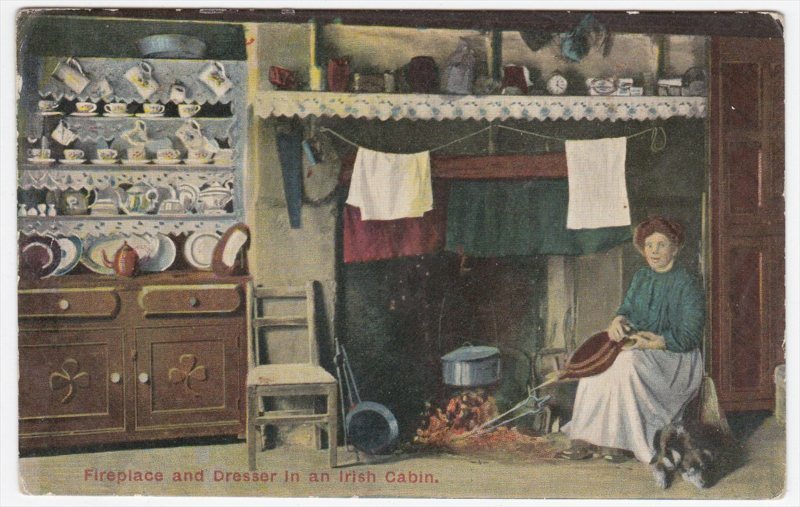 This postcard was published for Easter 1918, and was given to the National Museum as part of a collection of similar items by Sean Prendergast, Commanding Officer of ‘C’ Company, 1st Battalion of the Dublin Brigade of the Irish Volunteers, who served in the Four Courts in the 1916 Rising, and later of the Irish Republican Army. Fergus O’Connor was born in Cork City, the son of Thomas and Ellen O’Connor. Thomas was a sergeant in the Royal Irish Constabulary originally from Co. Offaly, and Ellen was a native of Cork. In 1901 the family are listed as living in Number 2 Dyke Parade in Cork City, and Fergus, aged 25, was working as a clerk in a bakery. Sometime after this he started publishing picture postcards, mostly featuring Cork and its environs. 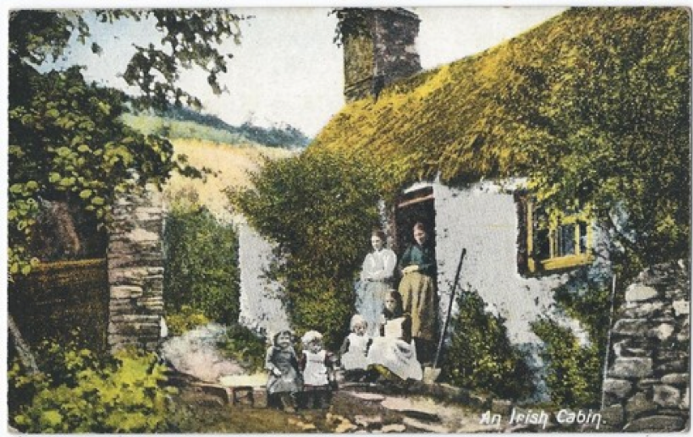 He also published the typical early 20th century images of Ireland and the Irish, including thatched cottages and their interiors. Having spent the first years of his professional life in Cork, the family moved to Dublin. By 1911 they are recorded as living in 44 Eccles Street, where Fergus established his publishing business. 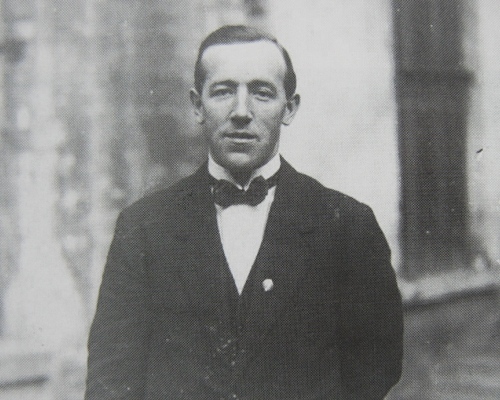 Though he does not appear to have taken any major part in the 1916 Rising, O’Connor was interned, first in Dartmoor in 1916, and later transferred to Lewes Prison in 1917, most likely for publishing pamphlets such as the ‘Oration of P.H. Pearse over O’Donovan Rossa’s Grave’ in 1915, which would have been seen by the British government as seditious material. 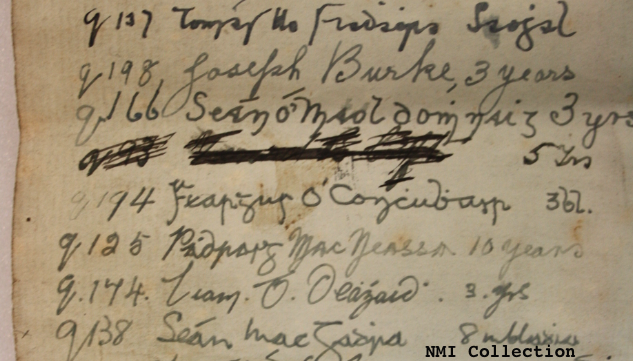 He was one of the 120 Irish Prisoners in Lewes Gaol who signed a list, giving his prisoner number as 194, and his sentence as 3 years. He is mentioned in the Bureau of Military History witness statement of Robert Brennan of the Wexford I.V. Brigade, who was also interned in Lewes, as always planning some trick or another, and describes one he played on a particular prisoner officer. Fergus clearly not only had a sense of humour, but a bit of daring about him too! O’Connor was released from Lewes sometime in 1917, and started publishing republican material again, largely due to his business relationship with Sean O’Casey (for whom he published ‘Songs of the Wren’). O’Casey was a friend of Thomas Ashe, who was imprisoned in Lewes Gaol (it is possible that O’Connor had also known him there) and later Mountjoy in Dublin in 1917. Ashe died on 25 September in Mountjoy of force-feeding whilst on hunger strike. In the autumn of 1917 O’Casey instructed O’Connor to publish the ‘Inquest on Thomas Ashe, The Verdict of the Jury’, and also ‘Let Me Carry Your Cross For Ireland, Lord’, the last poem of Thomas Ashe, in time for Ashe’s funeral, which was attended by tens of thousands of people. ‘The Story of Thomas Ashe’ by Sean O’Casey was also published by O’Connor in November 1917. In the following years O’Connor published numerous republican pamphlets, including ‘A Call to the Women of Ireland’ by Constance Markievicz in 1918, and ‘The Declaration of Irish Independence’ at the First Dáil in 1919, which was suppressed by the British government. This Easter greeting card was sent by Countess Constance Markievicz to Sean Prendergast on 31 March 1918, signing herself as ‘The Little Countess’ on the reverse. Sean had been a member of the Dublin Branch of Fianna Eireann, which was co-founded by Markievicz in 1909, so was probably acquainted with her from this time onwards. The imagery on the card is typically republican; it features an image of an Irish Volunteer in full uniform, Celtic designs to side, and the Irish tricolor flag planted in a nest of three eggs, also in green, white and gold. The card is primarily a memorial to Thomas Ashe, who died just six months previously, with his photograph in the top centre and a verse of his poem ‘Let Me Carry Your Cross For Ireland, Lord’ to the side. The celebration of Easter was, for nationalists, now firmly linked to the commemoration of the 1916 Rising.